Nosey & Tyke, Two Lives One Story! Don't Let Them End the Same! One weekend in April 2015, was an important weekend for circus elephants, as the film "Tyke Elephant Outlaw" had its world premiere at the Sarasota Film Festival in Florida. "Tyke Elephant Outlaw" is a gripping documentary film about a circus elephant called Tyke, who on August 20th 1994 made history, when she went on a rampage through Honolulu. One elephant who desperately needs the "Tyke Elephant Outlaw" film to have the same impact & lasting effects as Blackfish has had, is Nosey. 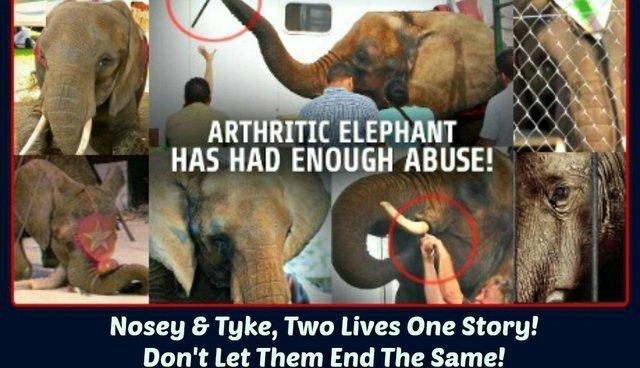 Like Tyke, Nosey has suffered abuse and has, in the past, lashed out against a handler causing injuries serious enough to require her handler take a trip to the hospital. Nosey is today's poster child for the neglect, abuse and the daily suffering of circus elephants everywhere! 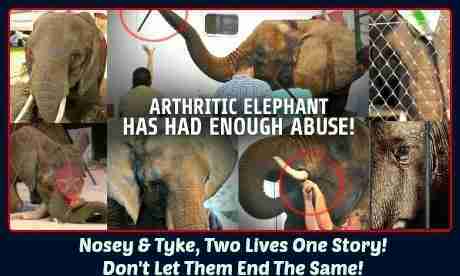 Tyke's story isn't over until Nosey (and all circus elephants) are spared the horrors of circus life! We may not be able to change things for Tyke, but we can change things for Nosey and other circus elephants! The film premiere was held in Sarasota, which is perfect because Sarasota is in the heart of circus country. It was John Ringling's home, it IS Kenneth Feld's home, it is 50 miles from the US headquarters of the Shriners and it's in the state of Florida which is home to most, exploited circus elephants in the US. including Nosey. I really hope this film gets a huge amount of support and is able to do for Nosey & all circus elephants what Blackfish is doing for captive orcas. To ensure the film has the kind of impact on society that Blackfish had & continues to have we all need to rally behind it and show our support.